DC’s Scarlet Speedster, the Flash, has been gaining in popularity over the last few years thanks to the success of the CW Flash television show as well as Warner Brothers’ Justice League movie (albeit to a lesser extent). Nowadays I see just as many young boys and girls rocking Flash memorabilia as I do for other comic book icons like Batman, Superman, Spider-Man, etc., and this boost in notoriety for my favorite DC hero has been great fun to watch. Of course, as with anything, characters with storied histories can have some, or a lot, of that history glossed over or forgotten entirely when put into the mainstream limelight. The Flash is no exception; in fact, he just might be one of the worst offenders. Audiences have found ways to connect with his screen adaptations, but the Flash is a deeply complex character (some of them more than others) whose adventures and feats in the comic books stretch light-years beyond those seen in any other medium. Today’s “Flash Facts” will serve to highlight some of the greatest feats of speed accomplished by the many Flashes in DC comics. This first of the iconic feats of speed is both to serve as a baseline for the type of speed that we’re dealing with here, as well as to set the record straight on the subject matter. 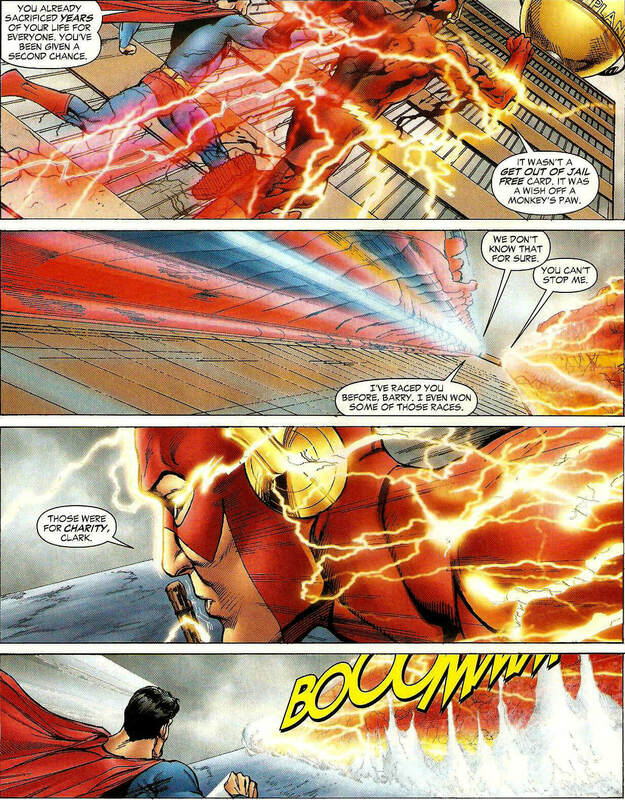 For decades, both fans of the Flash and of Superman have debated who is faster. The question of “Is the Man of Steel or the Fastest Man Alive faster?” has been no small topic of contention amongst DC fans. In 2009, Geoff Johns and Ethan Van Sciver gave us one of the greatest Flash stories ever told: Flash: Rebirth. In said story, the great debate was put to rest. 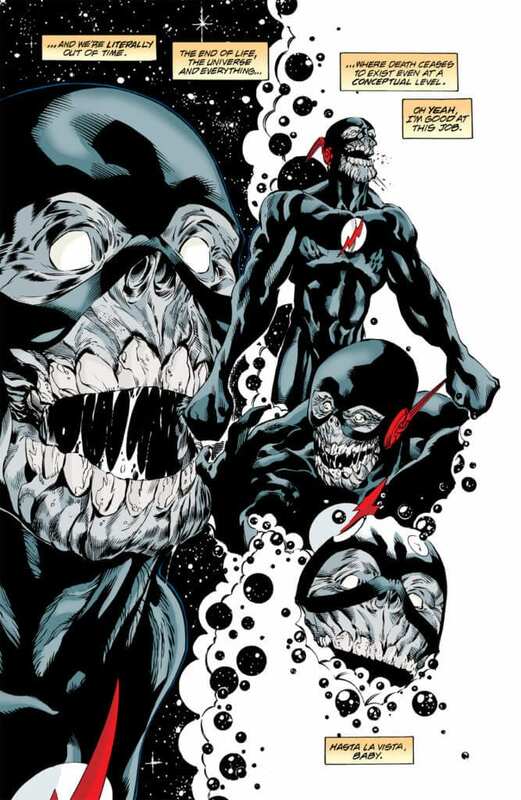 Barry Allen was becoming corrupted by Eobard Thawne’s Negative Speed Force energy and turning into the next Black Flash (the physical embodiment of Death for speedsters). Determined not to be a danger to any of his friends, Barry dashed away with the goal of trapping himself within the Speed Force so that he would be unable to bring harm to anyone else, having already turned two individuals into ashes. Superman followed after his longtime friend, not wanting to allow him to sacrifice himself yet again when they had only just gotten him back (read Crisis on Infinite Earths). Confident that he could prevent his friend from making another sacrifice, Clark explained to his former Justice League teammate that they had raced a number of times before and that he had even won some of those races, to which Barry Allen simply replied, “Those were for charity, Clark,” and then left the Man of Steel in the dust, showcasing that their speeds didn’t even belong in the same conversation. Next on the feats of speed list also comes again from Barry Allen in New 52 Flash #3. Barr is known for making heavy use of his molecular vibration abilities, but he cranks things up a notch in this issue when a full 747 passenger jet is going to crash into a Central City bridge, spelling certain death for not only the passengers but those traveling across it. Leaping off said bridge, Barry phased himself into the plane and held onto the nearest aisle seats, then began to vibrate not only his own molecules but also those of the jet itself and every passenger on it. Barry successfully phased the plane through the bridge, which showed how much concentration and control over the Speed Force he possessed. A quick side note here: in the New 52, Barry Allen uses his vibration abilities more than virtually any of his other powers aside from running. Next up is quite possibly the single most iconic use of speed by a Flash in the history of the character: of course I am referring to Barry Allen’s ultimate sacrifice during Crisis on Infinite Earths. During this continuity-resetting event, the Antimonitor was attempting to destroy the multiverse, having built a gargantuan weapon which he dubbed the Antimatter Canon. This weapon possessed enough power to destroy entire universes (that’s not overpowered at all), and it was Barry, not Superman or any of the other powerhouse DC multiverse heroes, who ran so fast that he created a speed vortex around the Antimatter Canon which was powerful enough to contain its energies. By literally running himself into oblivion, Barry became the savior of the universe. Spoiler alert: Barry didn’t truly die, but rather became trapped within the Speed Force for years (two decades for readers). Let’s give some of the other Flashes some love, shall we? If you’ve kept up with DC comics during the present Rebirth continuity, then you are aware that the original Wally West is back and DC has firmly established that he is not only the true Fastest Man Alive but officially the fastest thing to have existed ever in the universe. Classic Wally West fans have long known that he was the fastest Flash, having witnessed him perform more feats of speed than anyone else ever has. 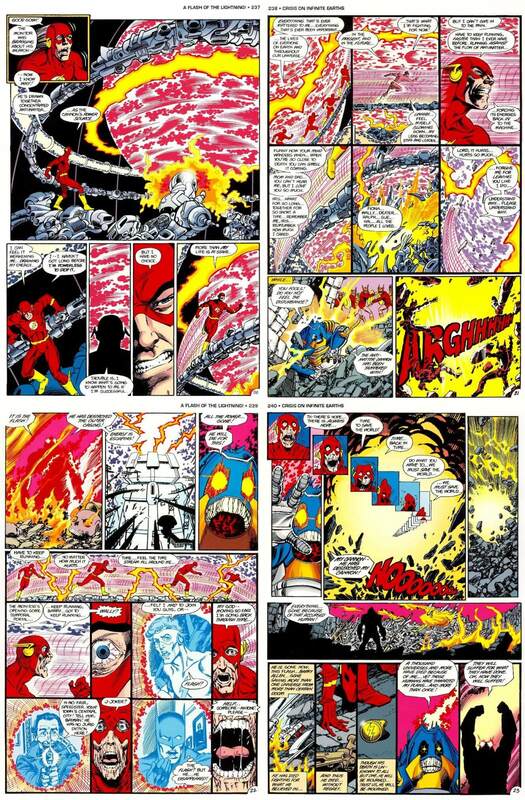 One of these is when Wally became the first speedster ever to enter the Speed Force and then exit it of his own volition (something that he does a number of times afterward, including pulling his mentor Barry out of it in the aforementioned Flash: Rebirth). During the Terminal Velocity story arc, Cobra was going to eradicate Keystone City along with Wally’s love Linda Park. Forcing himself to run faster than he ever had, he entered the Speed Force and became the first ever speedster to achieve Speed Force Nirvana (essentially a demi-god of the Speed Force), which means that he no longer taps into its energies but instead mainlines it so that they constantly flow through him. Wally takes on a golden glow upon achieving this form, and he is able to resist being trapped within the Speed Force. Considering Barry Allen’s twenty-year absence was due to an inability to escape the Speed Force, this is no small matter. Next up is another Wally West feat, and one that is easily forgotten among the numerous feats of speed that he has shown. For this feat, a thermonuclear bomb had been set off (meaning it had already detonated), and Wally pushed himself to save over half a million people and carry them over 35 miles away from the blast in less than 10 picoseconds. To get all scientific here, that breaks down to 1/100,000,000th of 1 second. Going this fast in his present state nearly melted his suit right off of him. Despite this, he was successful, and this is one of the coolest examples of a speedster pushing their own limits to date. I wasn’t kidding when I said that classic Wally West performed more feats of speed than all the other speedsters combined, as the next one is one of the most ridiculous. For this speed feat, an alien race known as the Gamblers forced Wally to race an entity called Krakkl across the universe to determine the fate of the Earth. Wally struck a deal with the Gamblers afterward to race them from the other side of the universe back to Earth. The catch? The Gamblers have the ability of teleportation, which is instantaneous, but Wally absorbed the kinetic energy of everyone on Earth and managed to run back home faster than instant teleportation. Can you say, “overpowered”? Last up is a Wally West fan favorite, as it showcases just how much more powerful than simply running fast the Flash really is. The alien known as Zum was a speedster from another world and, beyond that, possessed the strength and durability of Superman. Wally faced off against this superbeing in a test of speed and ran so fast that Zum lost track of him. This feat wouldn’t be nearly as impressive if it ended there, however, so in typical Wally West flair it doesn’t. Wally then wound up with a haymaker for the history books as he used his speed to channel his momentum into a single punch with the relative mass of a white dwarf star. Wally notes that he could have hit Zum over one thousand times with this punch, but a single strike was all that he needed to knock Zum into orbit and send him crashing back down into a crater of defeat! So there you have it, some of the most impressive feats of speed as performed by our favorite resident Scarlet Speedsters of the DC universe! This list is far from comprehensive, as both Barry Allen and Wally West have performed numerous feats of speed over the years. Some honorable mentions are: Wally West in DC Rebirth Titans traversing over 7,000 miles in under six and a quarter seconds to save all of his fellow Titans team members and Linda Park, Wally and Barry racing across the world to break the Speed Force barrier, and Bart Allen absorbing the entirety of the Speed Force during Infinite Crisis. What are some of your favorite Flash feats of speed? Let us know in the comments or on Twitter or Facebook, and we’ll catch you all next time when we talk about all things the Flash!